Healthy date bars are energy bars made by combining dates, desiccated coconut and walnuts. Finally topped with chopped almond and pumpkin seeds. These bars are gluten-free and vegan. Energy bars are no bake healthy snack that requires just few minutes to make and are packed with protein, fiber and nutrients to keep kids fueled until their next meal. The most important fact is these bars tastes too delicious and irresistible even though they are sugar-free. I usually try to reduce sugar as much as possible for my daughter Samyu and prefer healthy food such as this date bars, Oatmeal energy bars,strawberry banana milkshake, pineapple banana smoothie that boost her energy and keep her full until next meal. 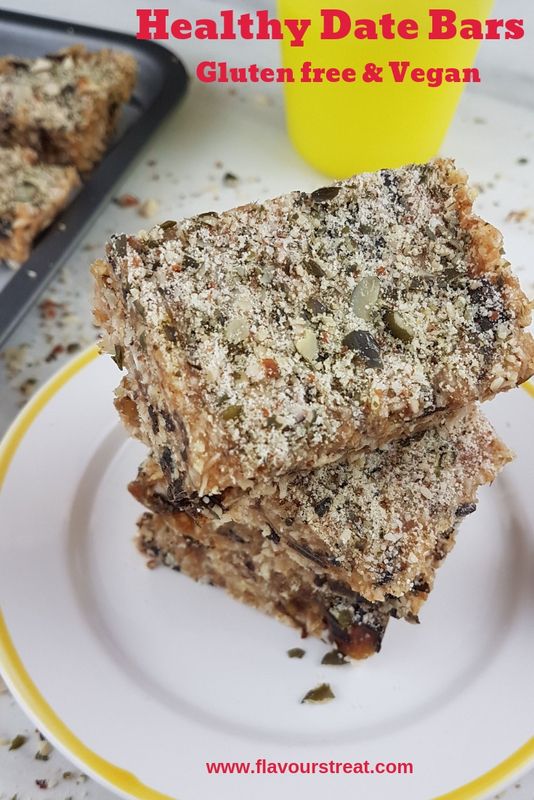 Healthy and tasty homemade energy bars with just few ingredients is a win-win for both parents and kids. This recipe requires no cooking or no baking, no refined sugar. Dates are good source of potassium, As dates are so sweet they act as perfect natural sweetener and an alternative to added sugars in any dates recipe. All it requires is just few ingredients and few minutes to whip up this quick and easy to make dates bars. 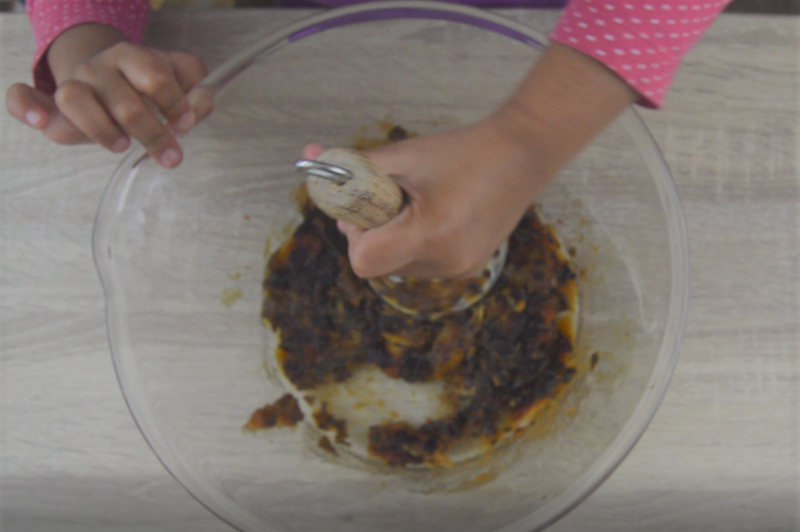 Best part for parents is that this is a perfect recipe to engage kids in making their own dish which really gets them eating the right things from young age. Fun part for kids is that they can choose their own add-ons. The sky is the limit if they really want to choose something that goes into these bars, with their favourite add-on they are more likely to eat them without any fuss, guaranteed. You can play around adding other ingredients. You can swap out walnuts for almonds, cashews, pecans or you can add half walnuts and half other nuts of your choice. Ground cinnamon, ground cardamom, ground nutmeg are an awesome add-ons to infuse more flavours into your bars. Substitute almond or pumpkin seeds with flax seeds, chia seeds or melon seeds for crunchy topping or you can totally skip the topping as well. Some chocolate chips or cocoa powder makes a best add-in for kid appeal. A to Z challenge, a challenge initiated by super active bloggers Jolly Makkar and Vidya Narayan on Facebook Group, wherein a group of bloggers come together and we choose key ingredients alphabetically to cook and post a dish every alternate month. This month alphabet is ‘D’, so my contribution for this month is healthy date bars. Soak pitted dates in hot water for 1 hour or until it softens. drain the water and keep dates aside in a bowl. In a deep bowl, place dates and mash them with potato masher. Now add desiccated coconut and coarsely ground walnut. Stir in all the ingredients together until well combined. Now line a tin/container with parchment paper or wax paper. Transfer the mixture, spread evenly and press it firmly with back of spoon or spatula. Top it with chopped almonds and pumpkin seeds. Wrap and chill for at least an hour or until it sets. Unwrap and cut the bars. Enjoy the delicious and healthy date bars. Nuts can be used raw or roasted, roasting adds toasty and nutty flavour to the bars. Store these bars in an air tight container in fridge for a week or in freezer for up to 3 months. (Mine disappeared in a day). Experiment with different nuts and seeds combo when you make your next batch. Though you mix and match ingredients always make sure to keep dates in the recipe as it acts as a binding agent. Easy process is to blend all the ingredients listed under “for bars” in a food processor. Place all the ingredients in a food processor, pulse few times for 30 seconds or just until they break into crumb size pieces. Scrape the sides of the container, continue the pulse for 1-2 minutes or until all the ingredients have clump together into a ball. (Note: I didn’t use this process as I was pretty sure my little chef might end up with a paste like consistency which totally ruins the texture of bars. I had to choose an alternative option only due to such unavoidable situations). It is not necessary to soak dates in hot water if you prefer to blend all ingredients in food processor. (Note: I had to soak them until they turn soft so that it’s easy for little chef to mash them). Now stir in all the ingredients together until well combined. Unwrap and cut the bars and enjoy the delicious and healthy date bars. Use chopped almonds and pumpkin seeds as toppings. You can clearly see topping here is not chopped nuts rather coarse powder. That's because of extra pulsing function of food processor as little chef likes it!! Easy process is to blend all the ingredients listed under "for bars" in a food processor. Place all the ingredients in a food processor, pulse few times for 30 seconds or just until they break into crumb size pieces. Scrape the sides of the container, continue the pulse for 1-2 minutes or until all the ingredients have clump together into a ball. (Note: I didn't use this process as I was afraid my little chef might end up with a paste like consistency which totally ruins the texture of bars. I had to choose an alternative option only due to such unavoidable situations). Do let me know if you make this date bars. I love to get feedback from readers. You have made an already healthy and delicious recipe even more so with the seed toppings. One helping of this will meet my daily quota of healthy seeds and dates. Glad you find this recipe useful. Dates and nuts make such healthy and power pack combination. These no bake bars look perfect . It’s so much fun to involve kids in kitchen. So true Poonam. Kids helping us in kitchen is a real fun and they get to learn as well. healthy date bars are actually power-packed snack. such a great combination of nuts and dates. I love it so much. for me its a post workout meal. So true they are absolutely a power packed snack to enjoy. Love the detail recipe of these healthy and awesome energy bars.Lovely share with cute helping hands. wow!! never knew making energy bars at home was this easy. Bookmarked and lovely clicks!! Yes indeed it is very easy and quick. I would love to know how you liked them when you get to try. These energy bars have all the ingredients which I love, definitely gonna try it. Bookmarked it. Awesome share !! I am glad you like it. I would love to know how you enjoyed them. Easy sugarfree bars. Great share…book marking it. Loved these bars , these look so delicious and of course are healthy too!! Taste bhi health bhi!! Awesome desserts! Glad to know you like these healthy bars. Slurp slurp, my mouth is just watering here. I love this simple and healthy recipe of this delicious bars. Loved those cute hands who are helping you & you were helping her also by holding the bowl, so cute 🙂 Absolutely yummy bars. Date bars sounds amazing. Loved the use of dessicated coconut. Its a pleasure to work with kids. Congratulations to your little chef. Awesome share. Such a lovely helper and such a healthy dates bar. I love these delicious beutiful bars and they are the best thing thta can be had. Thank a lot for your kind words. How fabulous those date bars looks, prefect to pack in anyone’s snack box. Am literally drooling over those bars.. Well done. Love these easy to make energy bars and so many options for the add ons. I’m sure your daughter must have enjoyed helping you. Yes Mayuri you can mix and match add ons and options are really endless. Little chef really enjoyed the process of making these bars. I am so glad to know you like this recipe. I hope you enjoy the process of making these little bars with your kids. Happy cooking. A very healthy and delicious bar and no cook is a treat. Loved seeing your little one helping around. I too involve my kids, and it is fun too work with them at times. So true renu, its fun to work with them in kitchen, they will get to munch on healthy snacks as well. Loved the detailed recipe, Samyuktha as your sous Chef and the tiny hands at work! I am sure she enjoyed the process of making the delicious bars and enjoying it too. Yes Vidya she enjoyed a lot. She love any kind of work in kitchen. Wow, Love this step by step. My kids may love this as travel snack, I will make and pack some on the next trip. I hope your kids enjoy these little healthy bars. I would love to know how it turned out. Absolutely, these are perfect grab and go healthy snack. Ooo these look and sound delicious! I am always looking for healthy snack alternatives for myself and especially for the kids for after school. These look perfect so will definitely give them a try! TI am so happy to know you find this recipe helpful. I would love to know how you and kids enjoyed them. These look like such a deliciously healthy snack option! Will definitely give making these a try with the kids! These look so easy to make and delicious too! I’ll have to try them. what a lovely and healthy snack for kids and adults as well. I have not yet given a try to these nutritious bars. Indeed Shobhaji. I hope you do try this recipe and let me know how it turned out. Thank you. Raw date bars are so common in the market and while there are companies making them healthy and without any preservatives, my heart bleeds out at all the packaging we throw with every date bar so we also recently started making our own date bars! I love your simple flavour combinations. I haven’t tried adding coconut yet to my date bars. Definitely going in, in the next edition! Absolutely true that and how proud they feel making their own dish.